When Khalid Al-Falih arrived at Davos in late January, the Saudi oil minister was exultant. The output cuts he’d painstakingly arranged with fellow OPEC states and Russia were working so well, he said, they could probably be phased out by June. Almost five months later, U.S. production is rising faster than anyone predicted and his plan has been shredded. In a series of phone calls and WhatsApp messages late last week, Al-Falih told his fellow ministers more was needed, according to people briefed on the talks, asking not to be named because the conversations are private. In their battle to revive the global oil market, OPEC and its allies are digging in for a long war of attrition against shale. “OPEC is now recognizing they need longer — and potentially deeper — production cuts than they have anticipated,” said Jamie Webster, a senior director for oil at the Boston Consulting Group Inc. in New York. From the beginning, Saudi Arabia saw a quick one-off intervention: reduce production for a few months and speed up the recovery. The strategy had an option for a six-month extension, but Riyadh initially thought it wouldn’t be needed. U.S. shale, the plan assumed, wouldn’t recover fast enough. And yet, shale has defied the naysayers. By the time OPEC meets in Vienna on May 25, U.S. output will be approaching the 9.5 million barrels a day mark — higher than in November 2014 when OPEC started a two-year price war. The rebound has been powered by turbocharged output in the Permian basin straddling Texas and New Mexico. Forced to adjust to lower prices, shale firms reshaped themselves into leaner operations that can thrive with oil just above $50 a barrel. Brent crude, the global benchmark, added 5 cents to $50.82 a barrel as of 9:59 a.m. in New York. On Thursday, OPEC’s own monthly oil market report said that production from non-members would rise 64 percent faster than previously forecast this year, driven mainly by U.S. shale fields. So far, OPEC hasn’t been able to “cut supplies faster than shale oil can increase,” said Olivier Jakob of consultant Petromatrix GmbH. Al-Falih and his OPEC allies have made some progress. U.S. crude stockpiles have started to drop and the amount of oil in floating storage is contracting. The International Energy Agency and banks including Goldman Sachs Group Inc. predict a further contraction in stockpiles in the second half of the year. Yet, the cartel faces big risks. The most prominent is that extending cuts lifts the oil price high enough for shale to hedge again, as it did earlier this year. “The dilemma now for OPEC and their key non-OPEC partners Russia and Oman is that cutting to support prices risks stoking the embers of a shale fire storm,” said Adam Ritchie, director at Petro-Logistics in Geneva. Increasingly, the oil market believes the real battle between OPEC and Russia, on one side, and shale, on the other, will take place in 2018, when an increasing number of observers predict U.S. production will flood the market as it did in 2014. U.S. shale producers used the price spike that OPEC triggered earlier this year to lock-in revenues for 2017, 2018 and, in some cases, even 2019. With their financial future relatively secure, they started deploying rigs. Since the count of active rigs in the U.S. reached a low last, producers have added an average seven units per week, the strongest recovery in 30 years. The rig spree, coupled with efficiency gains, is yielding strong production growth. In the first quarter, EOG Resources Inc. and Pioneer Natural Resources Co., two of the largest U.S. shale producers, announced year-on-year output jumps of 18 and 19 percent respectively. Smaller companies, including DiamondBack Energy Inc., Parsley Energy Inc. and RSP Permian Inc., achieved 60 percent to 80 percent increases. A lot more is coming. According to the U.S. Energy Information Administration, American crude production will surpass the 10 million barrel a day mark by late next year, breaching the record high set in 1970. 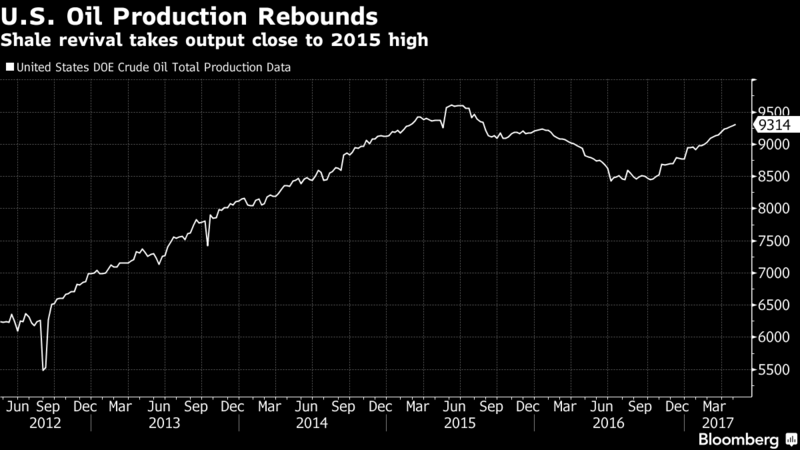 The shale boom will propel non-OPEC output up 1.3 million barrels a day next year, effectively filling up almost all the expected growth in demand.